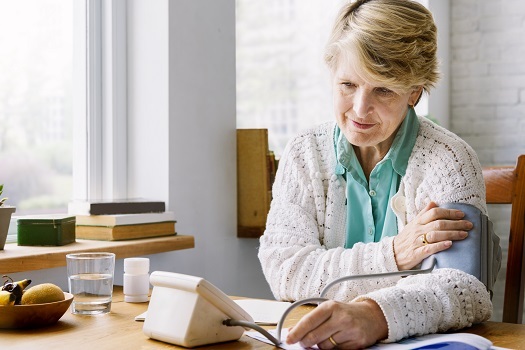 When seniors have high blood pressure, they’re at greater risk for heart disease, kidney failure, stroke, and other serious health complications. If your senior loved one was diagnosed with high blood pressure at a recent doctor’s appointment, there are several ways you can help him or her manage this issue. Here are five effective ways to reduce blood pressure levels in aging adults. Getting regular exercise is one of the best ways to reduce blood pressure levels. Activities that get the heart pumping, like power walking, aerobics, and swimming, can boost overall cardiovascular health. Inactive seniors should ease into new exercise regimens. Your loved one can start by going for a walk around the block every day. Once your parent’s body acclimates to that activity, he or she might want to consider signing up for a weekly water aerobics class at the senior center. For best results, older adults should discuss exercise plans with their doctors before embarking on new regimens. Aging adults who need help exercising should consider professional in-home care. Richardson senior home care professionals can be a wonderful boon to seniors. Whether they require around-the-clock supervision or just need assistance with exercise and household tasks a few days a week, seniors can enjoy a higher quality of life with the help of trusted in-home caregivers. Diet impacts blood pressure levels and overall heart health. To enhance cardiovascular function, seniors should follow diets rich in whole grains, lean proteins, fruits, vegetables, and low-fat dairy products. What older adults don’t eat is just as important as what they do. Blood pressure is highly sensitive to sodium, and it becomes more sensitive with age. Seniors with hypertension should limit their daily sodium intake, which means avoiding processed foods that have a high salt content. Seniors who don’t sleep well may have higher blood pressure than those who sleep soundly. When getting a solid eight hours of slumber, the body has time to heal and recharge. For some older adults, poor sleep is a sign of sleep apnea. Seniors who snore or have mid-sleep respiratory issues should speak to their doctors about this sleep disorder. When untreated, sleep deprivation can raise blood pressure levels. Aging adults can enhance their quality of sleep by making healthy lifestyle choices. If your aging loved one needs help managing everyday tasks or encouragement to adopt healthier lifestyle choices, turn to Home Care Assistance, a leading provider of elder care. Richardson Home Care Assistance provides professional in-home caregivers around the clock to help seniors live longer, happier, and healthier lives. The correlation between stress and high blood pressure is well known. For anxious seniors, finding effective ways to get rid of stress can be key to lowering blood pressure levels. There are various stress relief techniques older adults may want to consider. Some seniors find relief through gentle exercises like yoga and Pilates, while others prefer meditation. For older adults with generalized anxiety disorder, therapy might be the most effective treatment. Regardless of the source of the stress, developing helpful methods for managing to de-stress may normalize blood pressure levels. Smoking is one of the many habits that cause major harm to the cardiovascular system as well as the lungs. Older adults can lower their blood pressure levels by quitting cigarettes and other tobacco products. Drinking too much alcohol is also linked to high blood pressure. However, this doesn’t mean seniors should give up their twice-weekly glass of red wine. Instead, aging men should limit themselves to two drinks a day and women should limit themselves to one. Certain age-related conditions can make it more challenging for seniors to age in place safely and comfortably, but Richardson live-in care experts are available around the clock to help seniors manage their health. Whether your loved one is living with dementia or is recovering from a stroke, you can trust the professional live-in caregivers from Home Care Assistance to enhance his or her quality of life. Call us at (469) 573-4213 to schedule a free in-home consultation. Why Should Older Adults Give Up Smoking Immediately?